More shiping destinations from Bobby Ray's and Enhanced facilites. The goal for this mod was game enhancement with player convinence and game balance in mind (I hope). It's nothing huge, just XML and map editing, but I did put a lot of love in this so I hope you'll enjoy. 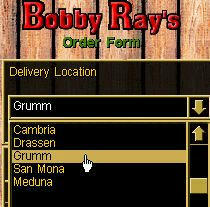 Once you reach mid-game, you'll probably have a base located at Cambria, San Mona or Grumm. The extended BR delivery locations make a player's life easier (for a higher delivery price ofcorse). Facilites are revamped and I added a few new ones. You now have a place to effectively train every stat. With some training you can put some of the new mercs to good use. Also, you now have a few more income options. And most imortantly, I've extended the tooltips of Facility assignmets so now you know exactly what each Facility does ingame. Read below for more details. 3. That's it, start JA2 normaly and enjoy. Savegame compatibility: The mod should work fine with an already started campaign. I did a few map changes, so worst-case scenario - you could have an item or two missing from the map. Once you reach and secure a certain town you have acces to vehicles that can handle shipments from Drassen further on. The extra transport and handling makes the deliveries more expensive. In Cambria you hire a few locals to take care of the shipments. In San Mona you broker a deal with Kingpin to take care of the stuff (but his price is steep). In Grumm, Freddo agrees to take care of your shipments. Meduna price is high since you gotta have the Queens guards on payroll in order to bring in stuff in her own backyard. Grumm H1 - Freddo's workshop now has an extension in the south-east end of the house. The keys to the new shed are on his counter. I chose these sectors as they're most suited for a base. Cambria and San Mona have Keith and Tony, so you can sell stuff you don't use right away. Grumm H1 has Freddo and Arnie to repair your electronics and weapons (since you can no longer repair them 100% on your own). - I also removed other usless locations (New York, Bagdhad...) so you don't need to scroll while finding your desired location. I focused on three areas: stat training, enemy detection and income. I made some tests ( SEE HERE ) and noticed that attributes were very hard to gain by practicing or being a student. For example you have a good merc but he can't carry enough. Although it is originaly intended, it was really a pain to wait almost 2 weeks for STR to go from 80 to 81. Not to mention AGI. So I revamped the facilities to enable faster training of all stats (except for LDR which goes up pretty fast). - Certain facilities heve assignments for TRINER/STUDENT. These are exclusive to MRK, EXP and MED. Performance is 250% for both trainer/student, which is great, but the price is high. Normally, the growth of stats is not the same for each stat and I gave all the new attribute/skill facilities a performance of 200/300. Now, to preserve the balance I made the price in ratio with the original speed of practicing. So you'll see that I made AGI practicing the most expensive, while EXP/MED training is the cheapest. I believe that 1.13 default had the A.C.A facility too powerfull while the Alma Mil. Headquarters wasn't good enough to justify it's use. So I revamped these facilites:. - ALMA has 2 new facilites: Satellite Access - Limited and Full (both detect enemies globally, but with varying precision. Refer to the tooltips and the list below for details). Their price is extremly high so use them to get a glimpse of the enemy locations then get the merc off the assignment or you'll go bankrupt. I've changed the Drassen Airport facility to help your inital financial situation (HINT: there are 2 new very cheap mercs from M.E.R.C ideal for this). The Mine facility now has an assignment to increase the mine's income by 10%. For balance reasons I've made high requirements in WIS & LDR for these facilities, so to make an extra profit, you'll first have to invest in cheap mercs to make them usefull. - Is now much more usefull: You can now have Trainers and Students and you can gain a bit of DEXTERITY. Revamped the use of Facilities to scout out enemy groups. Added Junkyard at G9. The locals started cleaning the mess from F9 to a Junkyard in G9. 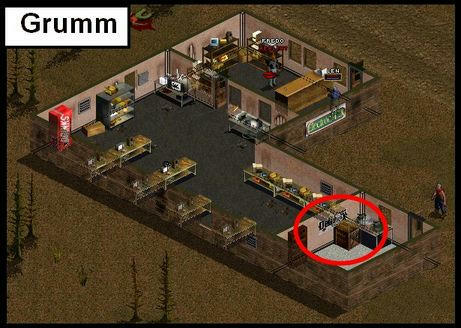 Luckily for you, you probably have a base there, which will make repairing of items easier. Extra Munitions Factory in H1 for easier repairs (if you have a base here). wow! That is exactly what I wanted in 1.13! I will check it right now. Kudos on the idea and implementation. I hope once a good balance is found for all this it can join the main trunk, I think it has the potential to be one of those new 'stock' features. Nice ideas. Probably going to steal a few for upcoming AIMNAS XMAS release I haven't come up with myself. Cool. I only disagree with decision to remove non-Arulco locations. It was just cosmetic, but added to immersion by showing BR as a service operating around the world and having clients other than player, and after navigating through several pages of equipment, you can sacrifice that 1.5 second to scroll down. Then again it makes sense for a website to filter destinations based on your location. Maybe a comprimise: Arulcan destinations on top of list and then comes the rest. Or would you like all of them in A-Z order? This going in the trunk? I'd be flattered, yes, but I still need to test and find a good balance. My stat gains and prices are based on theory and some average calculations. I still need to make a fast play-through to see how it all actually comes together. I think original A-Z would be better. There's even extra prompt when accepting order, so it's not likely to send stuff to wrong place by accident. Another question: do shipments to new locations can be stolen by Pablo (as they would technically go through Drassen airport first)? You don't need to remove "flavour" destinations, new ones for Arulco may be spliced in but getting everything arranged in the right order is a pain. This was done in UC-1.13 a while ago so all I remember is having to do the XML's twice when I figured out I need to manually alphabetize the list. I would vote for a middle ground and remove about half the old 'flavor' locations to keep the list short, or even change the 'flavor' items to be a bit more international. no more than 2 US locations, one for each coast should be plenty. Awesome addition. Trying it out now, with AR and SDO. Edit: Mine daily income is reset to 0$. Intended? Started old savegame; is new game required? I'm not sure but it may not be compatible with AR for AR has it's own shipment locations. This mod is not intended for Arulco Revisited. At least not the Shipments part. If you install it on top of an AR install, you'll have C5, G9 and H1 maps from the original game (+my edits), so theoretically it should work. But AR changes some other stuff like NPC locations, city borders, etc. so you'll probably have some inconsistencies. Your mine income bug could be the first symptom. Have some patience, because I was already planning to make a version of S&F just for Arulco Revisited - with edits to the AR maps for working new deliveries, more facilities and facility locations tailored for the AR map set. This is all xml modification, it's not that hard to make it work with WF maps. That's a really useful addition, great job! did somebody test it with AFS mod? Anyone running this with later unstable builds? How well does it work? works perfect to this day. I am still using it on Ja2 1.13 vanilla and AFS mod. I made some changes though. Some changes needed to be done in xml files for Kerberus (PMC) to work(adding entry points). Using the "standard" 4870 release but only get a error message at start. I might be years too late, but I just recently learned about this mod and wanted to say Thank you! Adjustable for AR (and other mods changing the maps) as well and working with newer version of 1.13 as (tested 8665). Still worth a look, in my humble opinion.